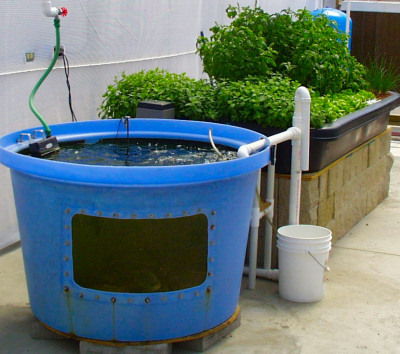 Aquaponics, also known as the integration of hydroponics with aqua culture, is gaining increased attention as a bio-integrated food production system. Hydroponics and aquaponics are close and often considered the same, but there are some distinct differences. With aquaponics, fish and plants are grown together in one integrated living soil-less ecosystem. The biggest difference is the nutrient source for the plants. With Hydroponics the nutrients are provided by refined chemical salts. With aquaponics, fish waste from living fish provides the food source for the plants, and the plants and plant beds can provide a natural filter for the water the fish live in. Aquaponic systems are a bit more complex than a regular hydroponic system because the nutrients are derived from the living ecosystem itself. Also with aquaponics there’s usually a series of filtration tanks needed to remove the accumulating solids as well as the degassing of accumulating gasses like hydrogen sulfide, methane and nitrogen from the system. There is also the plant to fish ratio to consider, not enough fish equals not enough nutrients to support the plants. 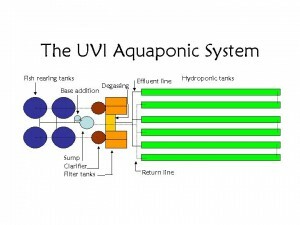 Typically aquaponic systems consist of several parts. 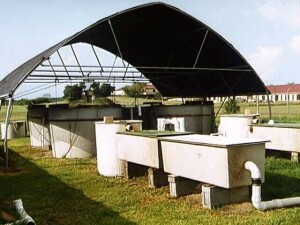 A rearing tank (fish tank), solids removal tank (to keep solids from building up in the system), bio-filter (to remove the accumulating chemicals and gasses, as well as promote the growth of the beneficial bacteria and microorganisms), hydroponic system (where the plants are grown without soil), and lastly a sump pump (that circulates the water supply). Depending on the setup type of a aquaponic system, it may or may not be using planter beds to grow the plants. Planter beds are like raised flower-beds that are usually filled with gravel (also called “gravel beds”). These gravel beds not only act as a bio-filter that strips out ammonia, phosphorus as well as other accumulating chemicals, so that freshly cleansed water can be recycled back to the fish tanks. But they are also the breeding ground for beneficial bacteria and microorganisms that break down the fish waste into the raw elements (nutrients) the plants can then absorb. These beneficial bacteria and microorganisms are essential to an aquaponic system working, because without them to turn fish waste into nutrients, the plants would not get the nourishment they need to grow. Aquaponic systems that are not growing the plants in gravel beds, but rather using a more traditional hydroponic system like a water culture or flood and drain systems, still require the beneficial bacteria and microorganisms to work. These traditional hydroponic systems don’t have the large surface area (like within the gravel beds) for the beneficial bacteria and microorganisms to largely grow and multiply. But they can be added directly to the water as a bacterial starter culture and grow in a separate in line bio-filter. The fish of course are an important part of the aquaponic system. The most common fish that’s raised in commercial aquaponic systems is tilapia. Some other fish that have been used include catfish, bass, crappies, trout, carp, pacu, goldfish and cod. Tilapia is a warm water fish so they can also tolerate higher water temperatures, though most fresh water fish that can tolerate crowding should do well in aquaponic systems. There are typically three ways of fish rotation in commercial aquaponic setups, Sequential rearing, Stock splitting and Multiple rearing units. Sequential rearing is where multiple age fish are raised in the same tank, then when the oldest ones are ready to harvest they are selectively caught and removed. Then new baby fish are added to replace them. Stock splitting involves stocking very high densities of baby fish, then periodically splitting the population in half as they get bigger until there ready to harvest. Multiple rearing units involves using a series of sequentially larger tanks. As the fish get larger they are either herded through a hatch between adjoining tanks, or into “swim-ways” connecting distant tanks moving them all as a group into the next size tank. All the multiple rearing units are usually connected to one filtration system that feeds the plants. An important factor is the water to plant ratio. That also has many variables, but can range anywhere from a 1:1 ratio to a 1:4 ratio. 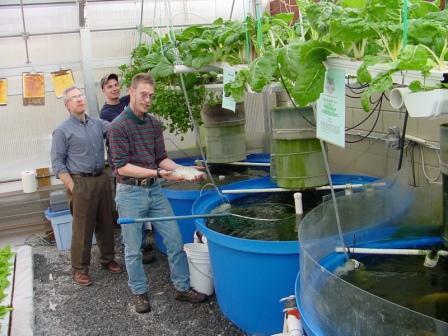 The variation in range depends on type of hydroponic system used (gravel vs. raft etc. ), fish species, fish density, feeding rate, plant species, as well as the depth of the growing beds etc.. You need enough fish waste to provide a constant amount of nutrients, but you don’t want waste to accumulate in the system or growing beds. The solids removal tank will take care of most of that, although if using the gravel beds solely as the bio-filter without a solids removal tank, solids can build up in the gravel beds. 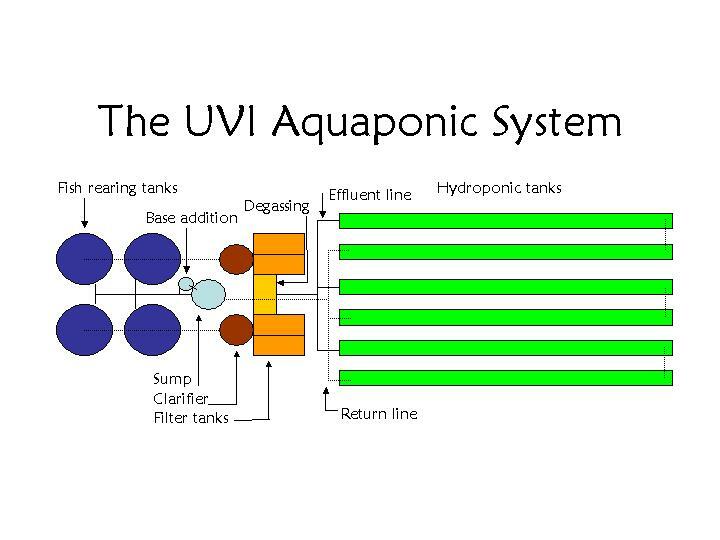 Aquaponic systems are complex carefully choreographed living ecosystems that can provide both fish and produce. But most commercial aquaponic farms need to run at full production for both fish and produce in order to be profitable. On the other hand, even though more complex than a regular hydroponic system, it can be quite rewarding to grow both plants and fish together. But be patient because it will likely take some time, as well as trial and error to get quite good at it (as with most things). You’ve done a pretty good job of describing how a commercial aquaponics system here, but please understand that the extra filtration complexity is only in a commercial raft, or DWC, system. In a media based system, which is what home and small scale commercial growers are using, there is no extra filtration and clarifying needed. It becomes a simple flood and drain system. 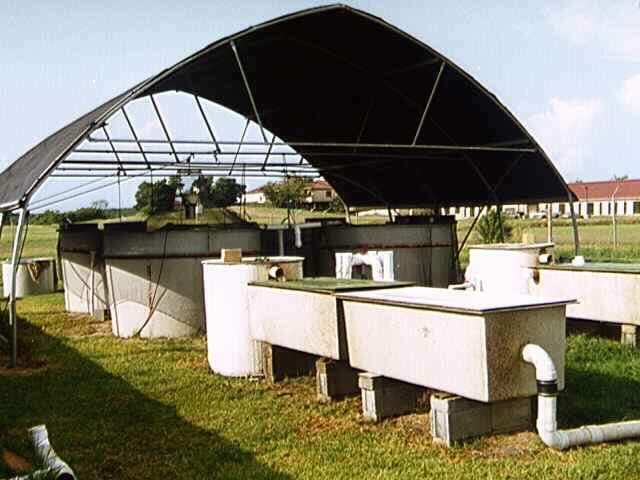 The fish water is pumped directly into the media bed (gravel or Hydroton) where the ammonia is converted to nitrates by beneficial bacteria, and the rest of the waste is converted to the remaining elements the plants require through microbes and worms. The water returns to the fish tank clean. I have grown for many years both hydroponically and aquaponically and I actually find aquaponics the easier of the two methods. I don’t measure or worry about EC or ratios of Grow and Bloom formula, I just feed the fish. I never dump and replace my nutrient water. There is no pythium – ever. It is really a great way to grow, so thanks for bringing aquaponics to the attention of your readers!